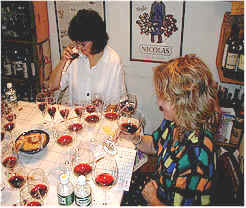 The 1999 vintage along the West Coast was one in which most Pinot Noir producers were smiling. The winter allowed for the vineyards to be in a rather deep "sleep." The growing season started a bit late and the weather up and down the coast was one which had growers wondering what happened to summer. The normal harvest was late, causing some nervousness. Mother Nature brought warm temperatures late in the season and the grapes actually achieved maturity both in California and Oregon. We compared a range of newly-released wines from this vintage. Note by Bob Gorman with Gerald adding his two cents' worth. 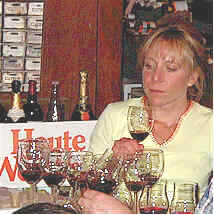 8th Place: PONZI VINEYARDS 1999 Willamette Valley Tasters came down pretty hard on this last place wine. 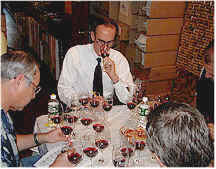 Various descriptors included green, veggie nose, high acid, bell pepper, bitter, unripe tannins. Another found a curious hint of pecan. A defender liked it for having a terroir dimension and was not disturbed by the somewhat high acid. Bob tended to agree. "The wine has some nice sweet cherry Pinot fruit and a subtle French oak presence. I actually like the stemmy note. It is unmistakably Oregon Pinot. Although it is a tad tight on the palate the high acid provides length to some nice, if not deeply concentrated, Pinot fruit; the wine has fair potential for development over the next 5 years or so. Gerald found exotically spicy notes with nutmeg and cinnamon elements, a touch of oak and a bit of orange peel to the fragrance. It's got moderate tannins and acidity and is a perfectly good bottle of wine. One star (scale of three). One taster found a green leafy element that was disturbing and another found a closed-in nose. It was more favorably received by another. There are hints of sweet tobacco, red licorice, chocolate and a nice tart raspberry character. Bob found a similar herbal, stemmy note but a nice core of ripe Pinot accented with sweet wood. Creamy Malolactic notes developed in the glass. There are some serious, appropriate tannins but Im disturbed by what appears to be traces of some moldy fruit. Gerald found this closed-in, the nose being quite reticent. This was the deepest-colored wine of the set and it seemed bound-up. Eventually some light oak came through with a hint of cherry. The wine is big and chunky on the palate, having more power and, at this point, less finesse than the rest of the field. A few years of aging should improve this. One-half to one star. One taster ranked this the top wine describing it as fabulous! Lots of French oak, good extract and very Burgundian. Another found the same meaty Burgundian thing but others found it too high in acid and sour cherries. Bob was taken aback Good God! a powerful H2S blast (baby diaper, latex etc.) and then dark, ripe, bing cherry fruit which pushes the envelope a bit too much. On the palate he found it awkward with a curious acidity and an odd Cassis note; uncharacteristically Syrah-like with a insistently flat aftertaste. Gerald detected some off-aromas right from the start, with hints of H2S and some yeasty notes. It does change (thankfully) with aeration, showing more toasty oak. I would not have recognized this, having tasted it a week or two prior to this event! I thought the flavors were nice, showing toasty oak and a fair bit of tannin. One-half star. Mixed reviews placed this wine in the middle of the pack. Various comments included well balanced, a disturbing skunky element, "minty, cotton candy, small and coarse, ripe cherry with a toasty oak finish, hints of orange and tangerine. Bob was equally ambivalent: ripe, thick bing-cherry fruit with oak, spice (cinnamon esp.) and roots; but fruit dulls in the glass. Its a nice enough mouthful showing a certain potential for development. Gerald found sweet oak, caramel and orange peel fragrances in this medium-bodied Pinot. The tannins are a shade aggressive for a wine with such a sweet perfume. One star. Tasters had a difficult time with this wine. Medicinal note, too acidic, small and aggressive, decent tannins but an odd, bitter finish, sour cherries and raspberry with green stems. Bob was far more enthusiastic. He found cola nut, pretty, cherry-like Pinot fruit with hints of raspberry jelly. He found a nice big mouthful with moderate complexity but lots of stuff; 3-5 years development in store. Gerald found light cherry fragrances with a hint of cinnamon and nutmeg and some pretty, toasty oak. Mildly tannic, the flavors confirm the characteristics found on the nose. One star. One taster found this third place wine to be the most Burgundian of the set. Another found licorice and spice in the nose and cherry and orange peel on the palate. Others were less impressed finding it by turns ripe, hot and simple and soft, vapid, ripe and hot. Bob found some rich, ripe Pinot fruit, spice, but opening up to show a whole berry fermentation edge reminiscent of Beaujolais. The palate also reminded him more of Gamay than Pinot, overly ripe with a hot finish. Drink it up soon before it falls to pieces. Gerald was one of the spear carriers for this wine, finding light oak, cherry fruit and lots of vanillin notes...very sweet on the nose. The same features are displayed on the palate, with soft, easy-going tannins. Yes, it's drinkable at an early stage. Why not enjoy it now? Two stars. A taster who gave this his first place vote found a wine which was big, rich, with lots of fruit and intensity. Another liked it for its Burgundian stink! Others found bacon, smoked meat, black licorice, green tea, and two tasters found a salty, seaweedy character. It was Bobs favorite by far. Pinot cherries in spades, a metallic/stony terroir, a terrific and judicious use of oak, Burgundian pretensions and sweet spice! A luscious mouthful of Pinot fruit all over the palate; acid/tannin spot on; so nice now but just wait a few years! 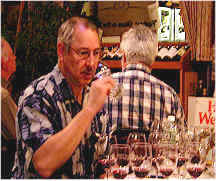 Gerald found lots of cherry notes with a gamey character with an herbal tone and nice, sweet oak. The same elements present themselves on the palate with ample oak and lots of cherryish fruit. Drinkable now, it might be preferable to catch this in its youth while it's so charming. Two stars. Here was an easy winner with seven first place votes. But comments were hardly unanimously glowing. Oak and candle wax on the nose and ripe, hot fruit on the palate. Underfruited and over-oaked said another. One taster liked its malolactic character giving it a strawberries and cream note. Another found middle-eastern spices: orange peel and cumin. Bob found a fair amount of American oak giving it a high-toned edge and aromas as much Merlot-like as Pinot-like. Quite a substantial mouthful with 2-3 years further development in store. Gerald found plenty of fruit to go with the sweet oak and cherry notes. There's a suggestion of something like band-aids in the fragrance, but only faintly so. Lots of berry fruit and nice oak...one and a half stars.